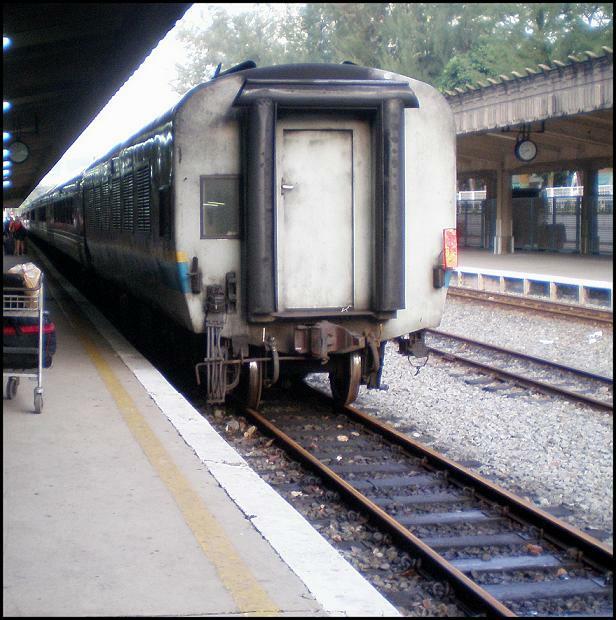 The train was a little late arriving at KL Sentral – about an hour and bit, actually – but as it had started its journey in Bangkok that wasn’t entirely unexpected so we were fairly cool about it. We’d heard that the advertised journey times didn’t include the time spent at borders, where checking passports, scanning baggage and waiting in queues took a lifetime so a delay was, well, inevitable. The station in KL is new and a major transport hub; it was full to the brim with travellers, heaving with life, shops and market stalls but well-signposted and easy to navigate – a foreign but altogether not unpleasant experience. A separate waiting area was set aside and cordoned-off for First Class passengers and although all the seats were full by the time we arrived we were left in no doubt that we were getting something special for the princely sum that our tickets had cost. A six-hour journey on the Ekspres Sinaran Selatan promised to be scenic and relaxing but it would require sustenance. The service on the train included a buffet trolley but, to be honest, I’m not comfortable about what’s on offer on the Stansted Express so, after a quick conference with Mission Control overshadowed by visions of what Malaysian catering might deliver, self-catering was the answer. Having some regard for the well-being of my stomach and determined to keep my relationship with the toilets on the train completely platonic, we set off in search of carry-on food. In a land where eating at street kitchens is a national pastime that was quite an adventure. There was a lot on offer in the station and it was being consumed with gusto at every turn but most of it was yellow and if it wasn’t granular it was kind of wet. We had something of a frantic half-hour but by the time the arrival of the train was announced we’d assembled from the most unlikely outlets a clumsy but reasonable picnic; nuts, bottled water, apples, bananas, some funny-looking sandwiches, dry biscuits and chocolate bars. Uniformed attendants ushered us onto the platform and into the sleek, polished metal coach. It was only as we stepped into the pink-liveried interior that we became aware of some alarming scratches along the outside, peeling paint, a carpet that was worn smooth in places and several double-glazed window units that had lost their outer pane. Some of those that were intact had fogged with condensation but the windows around our seats allowed some visibility, even if they were a little dirty. There were large, flat-screen TVs at each end of the coach, both with carefully drafted but badly spelled notes stuck to them apologising for the inconvenience of their not being in service. The seats, colours coordinated in a fetching orange, were akin to airline seats and equipped with footrests, reclining mechanisms and fold away tables. Unfortunately, they had carried a lot of passengers and made a lot of trips since they were installed so none of these luxury features worked and I suspect that the tables were best left where they were, wedged in the dark and sticky recesses of the seat arms. But it was comfortable enough and we settled to friendly smiles and greetings from fellow passengers. The decrepit décor was soon of no consequence as the Malaysian scenery took over and unfolded before us. The express rattled along the uneven and narrow tracks at a pace that wasn’t really slow, but couldn’t honestly be described as fast either. Small towns, villages, views to forested hills, rain forest and a truly frightening amount of oil-palm plantations drifted by on each side. It was a fascinating way to see Malaysia and as we went further south I became more appreciate of the Man in seat 61. 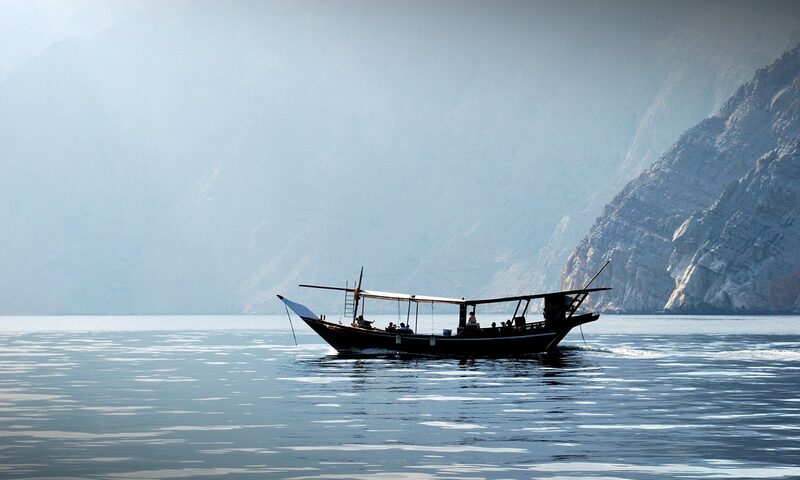 The journey was what we’d hoped for and was a relaxed way to travel the country. Anyone who has time should see Malaysia by train, although getting your hotel to provide a packed lunch would be worth the effort. The catering trolley did arrive but not until the threadbare aisle carpet had been meticulously and noisily swept by a young lady with a carpet sweeper – the first time I’d seen one used in any kind of accommodation that wasn’t stationary. It was a pointless exercise but a charming cameo. Although we accepted the small complimentary cake and bottle of water that was offered, our own food was by far more appetising than that yellow stuff we’d been curious about at KL, served here in a semi-liquid form in small, plastic boxes. I guess it’s a matter of what you’re used to; there was a murmur of understated excitement as the trolley cluttered into the coach so the food is clearly considered a highlight of the journey and it was consumed with silent enthusiasm. I was happy to pass on the meal, a decision reinforced later when I squeezed into the tiny toilet and barely avoided slithering down the gaping hole in the floor that opened ominously and unencumbered onto the tracks below. Bracing myself between wall and door I had a passing thought that there were practical advantages in being male. The towns along the route – the express officially grinds to a halt six times before reaching the border with Singapore – provide a fascinating insight into regional life in Malaysia and once again proved that making the journey by train was by far the best of the options available. The character of Malaysia’s colonial past was frequently reflected in the buildings and names on shops as well as the exchange of passengers, where first a Chinese and then a Malay or Indian community predominated. Towns with such exotic names as Seremban, Segamat and Kluang are significant stops before Johor Bahru, just before Singapore. Border controls in Malaysia are tiresome and move at glacial speed with lots of officious stamping of documents by suspicious and unsmiling officers. Johor was no different. All passengers had to disembark, remove their baggage from the express and wait in line below signs proclaiming death to anyone found with drugs. I don’t know about you but in every movie I’ve watched where someone was stopped at an Asian border with drugs secreted in their bag, from Bangkok Hilton to Bridget Jones, the tourist was innocent and the police immune to protest. I knew I hadn’t been watching our bags all the time. In the heat and intense humidity I wilted under the scrutiny of the border guards, trying but failing to avoid eye contact and certain they had me marked as a trafficker worthy of further examination. It seemed an age before, with a rare but curt smile, we were invited to start the long walk through the entire length of the customs building and back to the distant express. I was expecting a hand on my shoulder at every step. But that was the border; it had been the last stop for the majority of passengers so we rattled slowly over the causeway spanning the Johor Strait and into Singapore like a ghost train. Very quickly, the rural nature of Malaysia was replaced with a verdant urbanity of modern buildings, overpasses, expressways, roads and traffic. Singapore always looks like it was built last month and even though I’d experienced it previously the contrast with Malaysia was startling. It was sunset as the express crept the short distance into Tanjong Pagar, the Malaysian-owned terminus on the island. The journey had been surprisingly enjoyable despite the train now being past its best and a little seedy. We were about two hours late but pleased that we’d made the decision to let the train take the strain and planned to use it going north the following week. Kate collected us and we were whisked off to catch-up and recover. I reckoned I had about six hours before I was due to meet my guide and head back into Malaysia for a trek into the rain forest. It’s been a long time since I was in Kuala Lumpur so when Mission Control suggested that we might add a Malaysia leg to our recent Dubai trip that would enable her to see her godson in Singapore, my heartbeat quickened. Not, I hasten to point out, because I have more than a passing interest in the progress that small boys are making with their violin lessons; no, I was thinking ‘rain forest’ and ‘Crested Serpent Eagle’ and metaphorically rubbing my hands at the chance to reacquaint myself with the peanut shells on the floor of the Long Bar at the Raffles Hotel. My reverie was cut short, however, by the news that the journey between KL and Singapore would be by train. ‘Train?’ I asked. Now anyone who has spent a significant part of his life compacting his spine by commuting into London will share my immediate alarm. It’s not that I’m against travelling by train – far from it because I like travelling on comfortable trains; it’s just that I’ve had such harrowing experiences on the way to and from Liverpool Street station that when I heard the journey between KL and Singapore would take around six hours my life flashed before my eyes. Ever prepared, however, and familiar with my failings she introduced me to a fascinating and informative website called The Man in Seat Sixty-One. The time I spent browsing the site was very reassuring and that’s how we got to purchase First Class seats out of KL Sentral to Singapore for about £14 each. 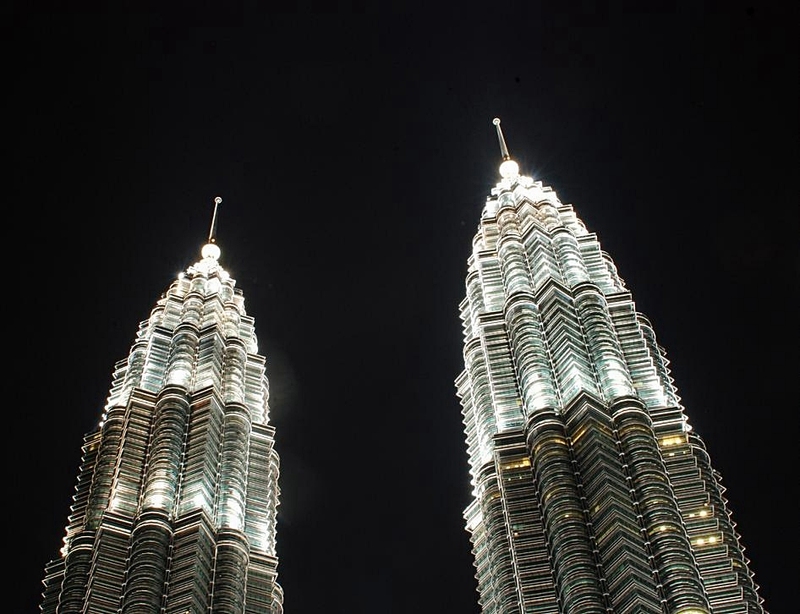 We’d planned to stay a couple of nights in KL and wanted to be downtown so had booked the splendid Mandarin Oriental, which sits right in the commercial heart of the city, next to the City Centre Park and the Petronas Towers. 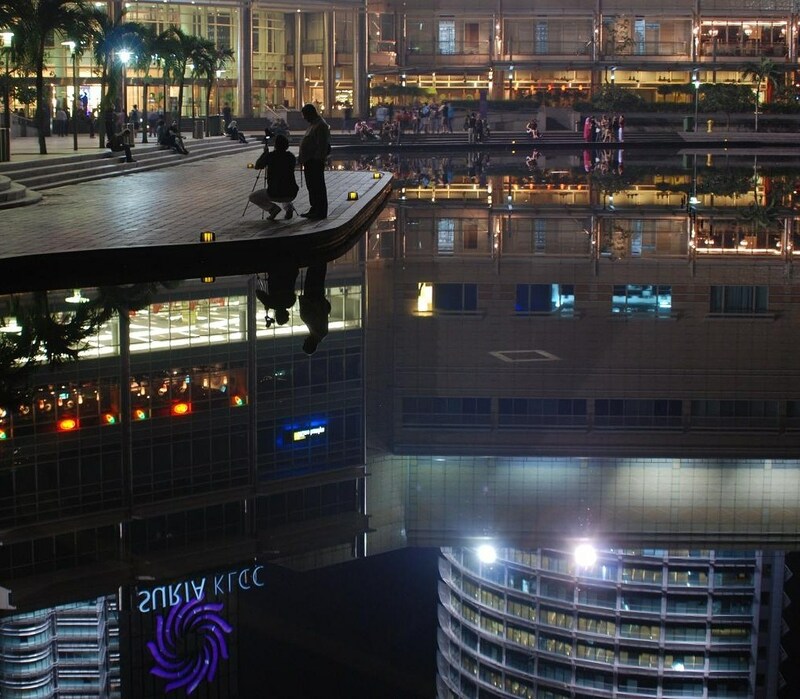 The centre of KL has shaken off a lot of its colonial past and now looks every bit a modern city. In some respects, the Oriental is an oasis of tradition in a desert of bland modernity, surrounded as it is by new buildings and high-rise blocks, shopping malls, steel sculptures in the park and, of course, those towers. But some things hadn’t changed, as the taxi-ride from the airport proved. The people are just as friendly, smiling and welcoming as they ever were; the driving still as eye-wateringly incompetent and heart-stopping. And, it appears, the locals still hold firm to the belief that if you don’t maintain a vehicle it will last forever. Mind you, there may be some truth in that judging by the condition of the dilapidated wrecks that careered erratically past us. I’ve always liked being in Asia. I love the food, the seductive greenness and colours, the heat and, especially, the level of service. The attention afforded by people who seem genuinely interested in doing their job well is excellent; there remains a clear understanding of the competitive edge that making the customer feel special can bring. That hasn’t changed at all. So it was pleasant and elevating when I found that everyone working at the Oriental knew my name almost from the point at which I checked-in and continued to greet me with a salute of respect even though I recognised none, hampered as I was by a confusing perception of physical similarity and a limited ability to address people whose forenames have only two letters. I enjoyed my first ice-cold Tiger beer of the trip in the excellent Lounge on the Park and again, the attention was faultless – although these days I find myself ever-so-slightly uncomfortable when men are unashamedly served ahead of women, particularly when the attractive waitresses are, how do I put it – flirtatious? Perhaps not – attentive is perhaps a better way of expressing it. This is a traditional grand hotel in the old style; I can’t recommend it highly enough and the pool, set as it is at tree-top level above City Centre Park, is beautifully located and a perfect place to start your day. Unless you’re a birder, that is. 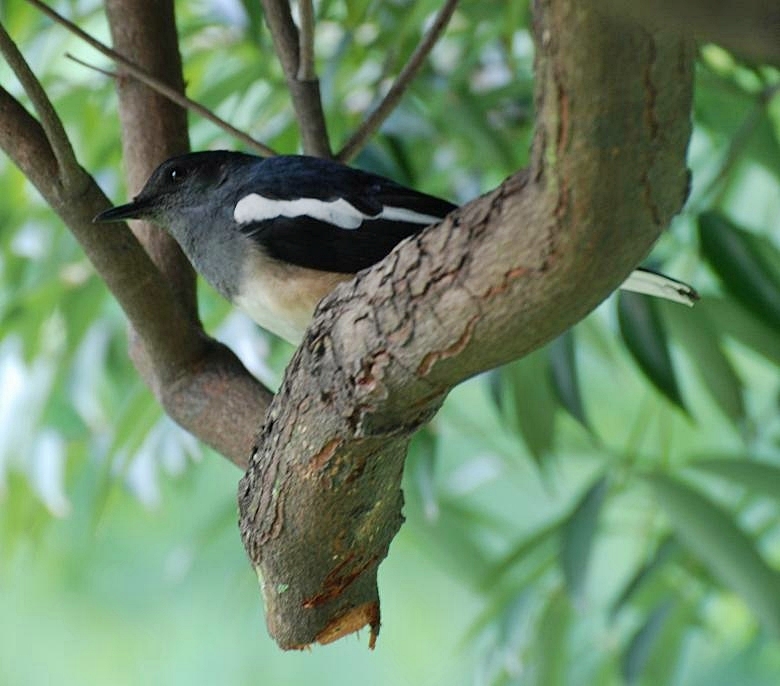 The park is well provided with mature trees and lush planting so I thought a quiet, dawn walk around it would be an ideal start to a list of south-east Asian birds that I would mull over in flickering firelight on a cold European night. And there were birds, lots of them; Magpie Robins, Asian Koels, Pink-necked Green Pigeons, Javan Mynas, Brown Shrikes and Black-naped Orioles, but the dawn chorus was drowned-out and the birds outnumbered three-to-one by joggers, practitioners of Taekwondo, group aerobicists from the conference centre and all manner of worshippers of the sunrise. I’d forgotten that in this part of the world the early-morning workout – together with the full-on, hi-tech, gizmo-laden, fashion statement outfit – is de rigueur. I’ve never seen so much silver velour. Coffee in the relatively uncrowded Oriental was welcome and pretty good, I recall. The driverless metro system is new since my last visit and, being little more than a schoolboy at heart, I had to ride it so we went down to the old centre and just walked. I’m a bit old-fashioned about cities – maybe because I’m from the centre of London – and believe you can’t really see and feel a place unless you get off the beaten track and walk it. There’s something other worldly about the back streets of Kuala Lumpur and, in some respects, time spent there can feel like time spent in another age. It still smacks of a colonial life and days of Empire and of course modern-day Malaysia is very much a product of occupying cultures. Perhaps it’s the number of people still getting somewhere on two wheels; perhaps it’s the fume-belching trucks in narrow roads piled high with green stuff and bales of material or loaded with animals; perhaps it’s the fact that most people are so busy getting on with the business of daily life that they generate a single-mindedness of purpose we’ve all but lost in the west. Life takes place on the street where shophouses, go-downs and restaurants spill out in a multiplicity of sounds, sights and smells. The Central Market is a little touristy now but the surrounding area still has a vibrancy that makes it a pivotal point in the city. We ate chicken dumplings, noodles and soup at a stall while KL bustled past us; traditional, excellent and cheap. Chinatown and Little India still felt authentic, dirty underfoot and, when one occasionally made eye contact with someone sitting way back in one of the shophouses, a little edgy. 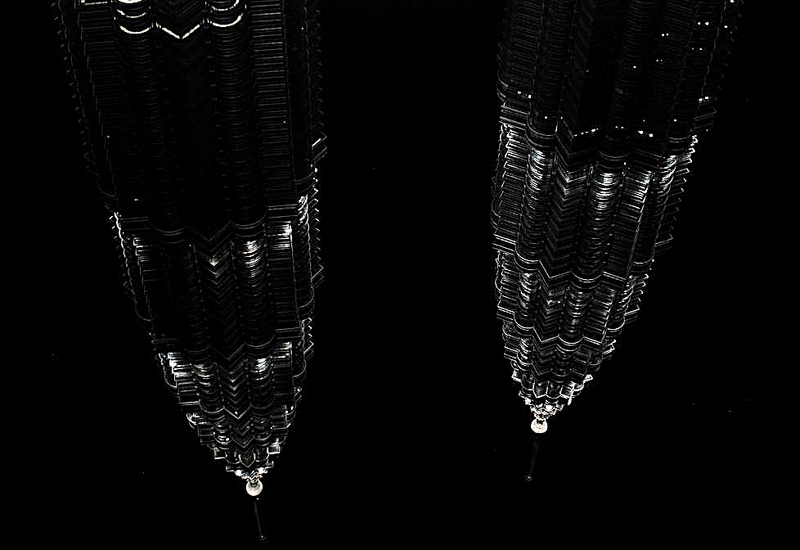 The Suria KLCC shopping mall, below the Petronas Towers and next door to the Oriental, is something of a contrast, a microcosm of the city. This six-storey behemoth with its own metro station sports outlets that we’d walked past in Dubai; Gucci, Prada, Tiffany & Co., Louis Vuitton, Chanel and even Marks and Spencer. 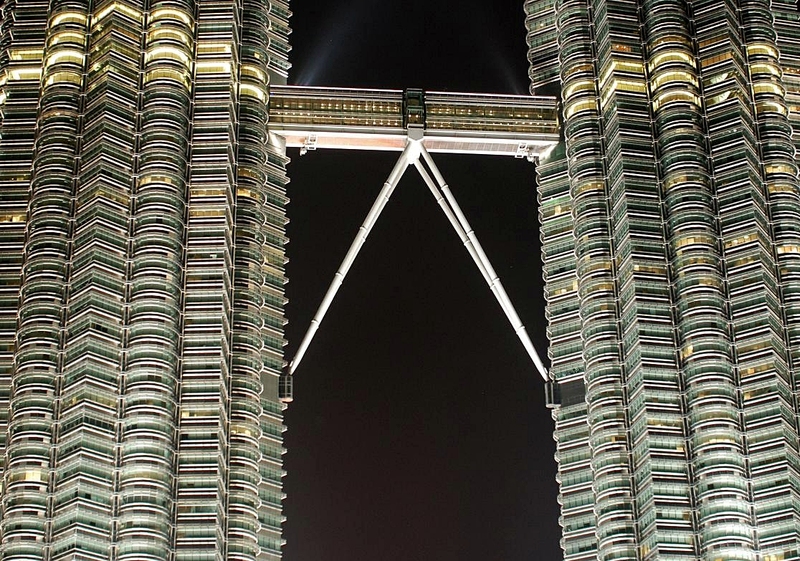 Popular – definitely; incongruous – not as much as one might think but what I liked most about it was the way that local families loaded up with ice cream at closing time and sat outside in the park, bathed in light from the floodlit Petronas Towers and watched reflections in the lake. Spending a pleasant hour amongst chatting families, teenagers discreetly falling in love and children running through the crowds isn’t listed as a tourist attraction but it certainly betters a few I’ve experienced. I enjoyed my reacquaintance with KL a great deal. There’s been a lot of new building and many changes since I was last there but some areas seem to have avoided wholesale redevelopment and retained their essential character. That probably owes a lot to a lack of money but I suspect it also has something to do with the charm of the Malaysian people and I can’t wait to get back there. Sadly, I expect by then they will have embraced even more of our western preoccupation with recreational shopping and made their restaurants and bars smoke free. But in a funny sort of way, I hope not. I had hoped to see a little more support for a ‘yes’ in the referendum on AV and with it, by implication, a glimmer of hope that election of our representatives would more accurately reflect opinion across a constituency. The expected result disappointed me but, truth be told, I wasn’t in the least surprised by the overwhelming kick in the nuts that our increasingly apathetic and bamboozled electorate delivered. The AV proposal on offer certainly wasn’t the best solution but it would, if nothing else, have unsettled the many politicians who see a seat at Westminster as a personal opportunity and not an obligation. It wasn’t to be and the possibilities of electoral reform being raised again in meaningful debate are too far into the future to contemplate. Of all the constituencies in UK only ten out of about 500 delivered ‘yes’ votes [and of those only Cambridge is held by the Liberal Democrats] yet everyone I spoke to about AV seemed to have no idea how it would work, why it was being proposed and what the consequences of its being adopted would be. So what were people voting for or against? Of course, a clear, sophisticated and political ‘no’ campaign, supported by an increasingly well-liked Prime Minister, provided gentle guidance even if it was a little disingenuous. But then, you’d expect that, wouldn’t you? Well, if you were advocating AV it would seem not; the ‘yes’ campaign, bespattered as it was with celebrities, seemed naïve, unclear and, eventually, whining. I heard more about how unfair the Conservatives were than about how AV was the important first step on the road to proportional representation. That old duffer Vince Cable has now described the Conservatives as ‘ruthless, calculating and thoroughly tribal’. Er, yes – perhaps realising that some while ago would have given your campaign more impetus, dummy. He has gone on to say that ‘you have to be businesslike and professional and you have to work with people who aren’t your natural bedfellows and that is being grown-up in politics’. Quite – so how dumb was Nick Clegg to describe the proposal as a ‘miserable little compromise’ at the start of the campaign? Badly wounded, he now appears less than capable as a senior politician and out of his depth, so one wonders, with this significant concession of the coalition behind him, whether his firmly held pre-election ideals can be transformed into political influence. As for me, knowing that my MP’s safe seat is even safer, I’ll be checking to see if he’s using his secretarial allowance to resurface his driveway during this parliament.